They’re not perfect but the price-tag and advantageous pros-to-cons ratio help the HAVIT G1W true wireless earbuds hold their ground as a contender in an increasingly crowded space. Within the space of the last two years two years, true wireless earbuds have rapidly gone from a growth category fought over by a handful of contenders to one that’s saturated with options both good and bad. As noted in our recent review of the AXUM Gear Bluetooth earbuds, the ability of even unknown brands to compete in the true wireless space continues to be one of the categories’ biggest allures. It’s always nice to have choices that go beyond the usual tech mainstays. Unfortunately, not every set of earbuds with an unfamiliar brand attached is going to be a winner. For every Zolo, you’ve got a NOVA. Thankfully, the HAVIT G1 True Wireless Earbuds manage to overcome the odds thanks to solid fundamentals and a unique hook of their own. Having true wireless earbuds that feature wireless charging isn’t game-changing - but it is nifty, and it serves to sweeten the already-slick cocktail of sound quality, Bluetooth connectivity, durability and battery life on offer here. From the moment you see them, the HAVIT G1W true wireless earbuds are practically screaming the word minimalism at you. The earbuds themselves are fairly featureless. They’re all clean surfaces and curved edges and made of a mix of hard and soft plastics that have been shaped for a tight, if-ergonomic, fit. At least, that was my experience. Ear size varies and, while HAVIT have included a few alternative ear-cups and ear-hooks in the box, it’s impossible to guarantee these will fit every ear shape out there - as is the case with any set of earbuds. There’s no real set up here beyond the usual. You take them out of the box, charge them up and pair them using Bluetooth. The G1W support Bluetooth 5 which, if you’re using a phone that also supports the next-gen standard, means that it uses less battery life, supports better audio quality codecs over Bluetooth and is generally better at maintaining a reliable connection. Charger case is also fairly compact - which is nice - and it does buffer up the battery life on offer here substantially - which is nicer. Still, in context, the HAVIT G1W earbuds themselves are far from a category-leader when it comes to battery life. That said, they do sit above the average when it comes to total hours of usage at approximately 21 hours. If there’s any gripes to be found here, it’s in the physical buttons built into the sides of the earbuds. Like a lot of other true wireless earbuds out there, the HAVIT G1W use a simple one-button control scheme. Tap to pause. Tap to play. Hold to bring up your Google Assistant or Siri. There’s no Alexa support. As someone who has reviewed a fair few of these true wireless options now, it’s a pretty familiar formula that yield familiar results. Pressing the control buttons is often a frustrating and uncomfortable experience, even in the best of times, as it involves pressing small plastic pods into the sides of your head. 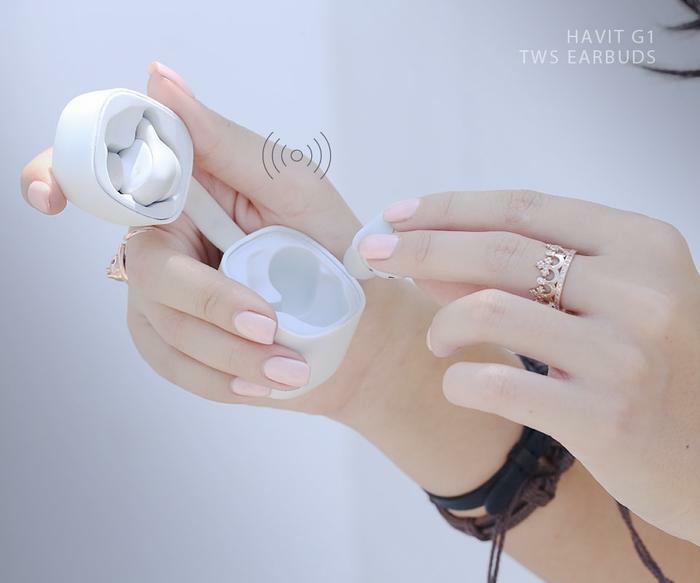 Despite this pain-point, we came away pretty impressed with the HAVIT G1W earbuds. The bass sounded bubbly, distortion wasn’t too bad and vocals scratched the right itch most of the time. I wouldn’t say they sounded the best earbuds I’ve ever tested but they definitely sit in the upper echelons of the category alongside Jabra’s 65ts and Zolo’s Liberty+. The former has better built-in microphones while the latter boasts significant gains in battery life. However, with a cheaper price-tag and wireless charging that keep it competitive, the HAVIT G1W are far from overlooking on account of these shortcomings. In practice, wireless charging support here is more of a perk than a significant advantage that sees the G1W rise above the rest. Again, it’s not a revolutionary inclusion but if you’re keen to cut down on another set of wires and already own a Qi charging pad or two, it’s a net positive and another reason to give the G1W more than a moment’s thought. The HAVIT G1W are probably the most compelling set of off-the-beaten-track branded earbuds we’re reviewed since we came away dazzled by Zolo’s Liberty+ back in January. They’re not perfect but the price-tag and advantageous pros-to-cons ratio help them hold their ground as a contender in an increasingly crowded space.